Take a look at this video of a robot creating a robot. A product of the GRASP lab at the University of Pennsylvania, it sprays foam onto CkBot Robot Modules to create a variety of new robots for a variety of different purposes. One of the key claims of modular robotics is to allow robots to be quickly adapted to unanticipated task requirements after being deployed to the field. Modular robots aim to address this requirement by having many modules from a small set of module types, that can be rearranged into a robot morphology to accomplish the desired task. Observing that such systems often assume that the robot body will be constructed of modules, which are generally heavy and expensive we suggest a less costly and more mechanically efficient alternative: constructing robot body part from self-hardening foam. 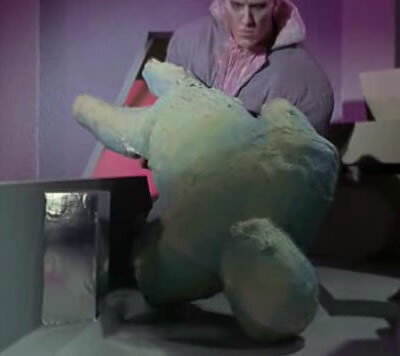 The spray-foam robots remind me of the android 'blanks' (malleable foam outside, circuits inside) used to create duplicates of your favorite Star Trek characters in the episode titled What Little Girls Are Made Of. In the Star Trek episode, these robots were also created by other robots.